Affidavit of service forms are notarized document that is useful to keep records. The form is filled after the service is done with the court. 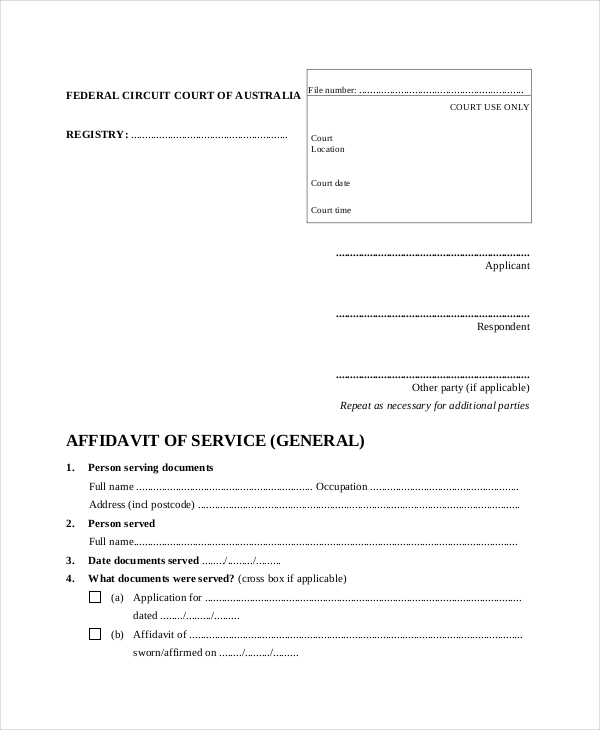 Each time a legal document is served, the person who is serving the document hast to fill up a form in a written format, about how these official papers were given. This is called an Affidavit of service. 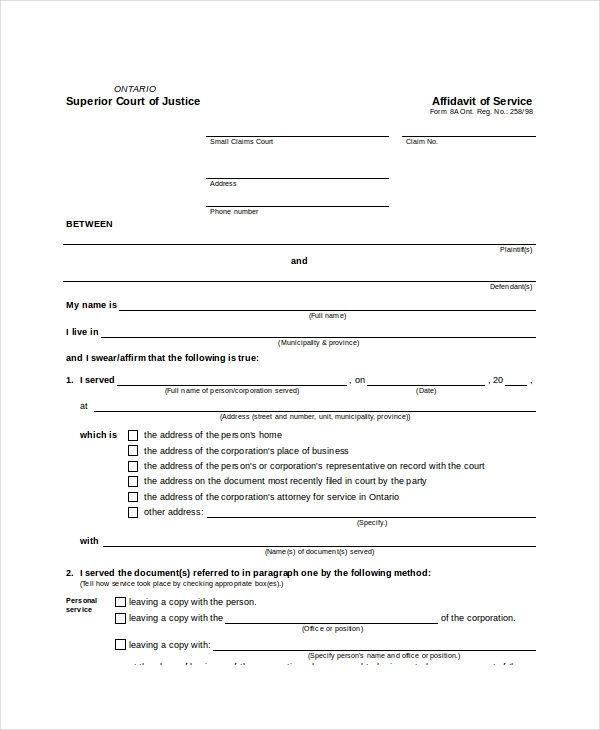 Most courts have such Service Forms for the convenience and record purposes. This sample form is by the Superior Court of Justice in Ontario that requires details about the steps that one is taking. The form has given the step by step process, about how to serve and complete this form. The 8a form needs details about the plaintiff and the defendant, contact number, time/date, manner of service and other details of the job. The details must be put in the Affidavit of service and the person who fills the form must truthfully swear to the facts that they are true. 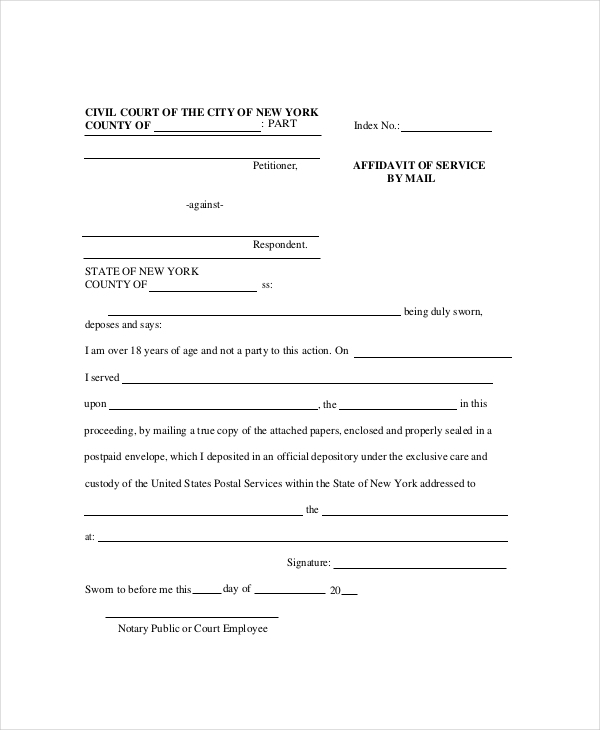 The State of New York issues this form which is by the civil court. The names of the petitioner and the respondent are to be written in the form. The person should be above the age of 18 to perform this task. This form can be filled up and sent by mail. This service must be sworn before an authorized witness by law swearing the affidavit. Apart from the date, time, location of the court, the name of the respondent, applicant and other party must be filled out in this form. The person serving this document and the person served must be mentioned and how were the documents served should be filled up. Person’s identification, served on person, witness information is required for further process. 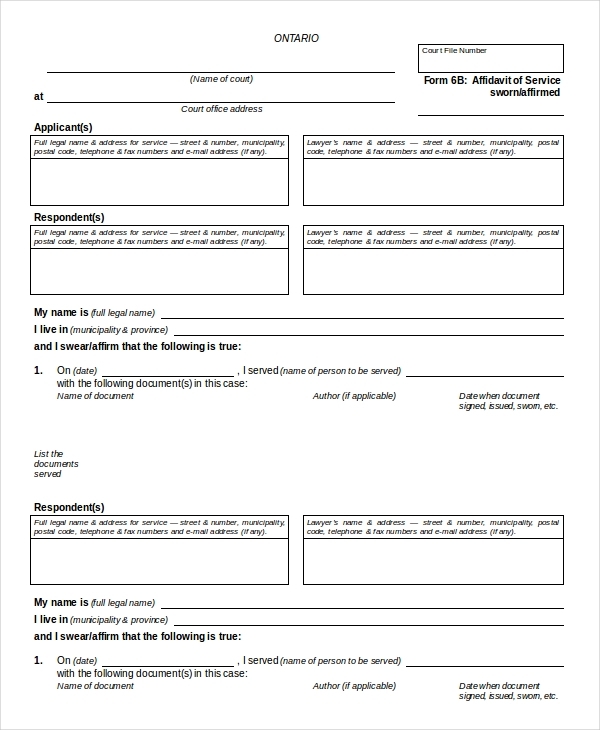 This is a general or universal affidavit of service form where one has to fill in the usual details as asked in the form. The form has name of the party or the person served, place where it took place, location and how the service took place. The witness needs to mandatorily sign the form. 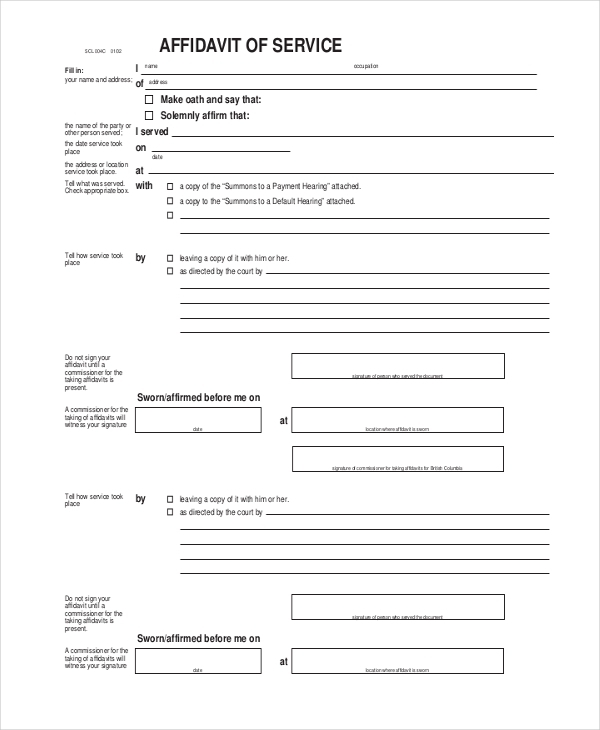 Along with the form, an instruction page is given for the person to get an idea about the form filling. 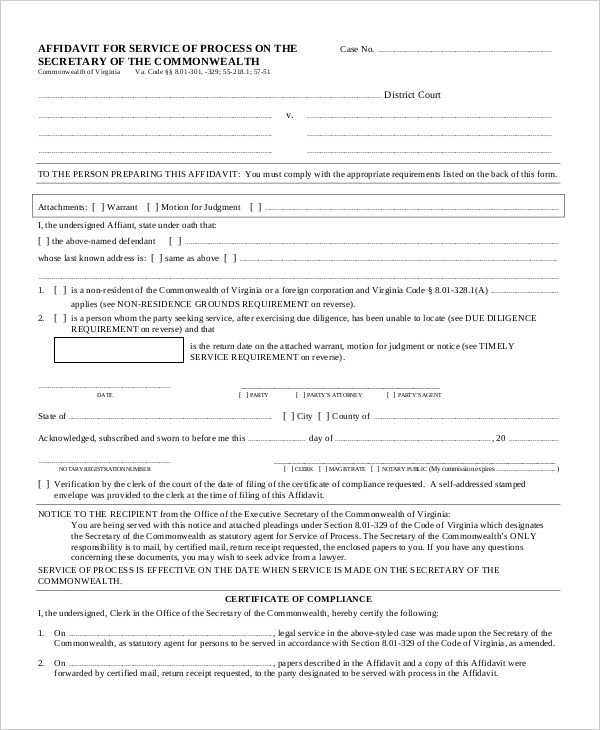 The form is to be filled up in black pen and needs to be signed only in in front of an authorized witness by law. If he/she is not present, it is not to be done. The description of the person served is to be written down as well as the name, address and time. Form 6B of the Affidavit of Service needs the full name, address, contact number and email address of the respondent and the applicant. The document is used for legal purposes and also for proof of record. It has to be mentioned weather the document was served faxed, enveloped or served through any other way. 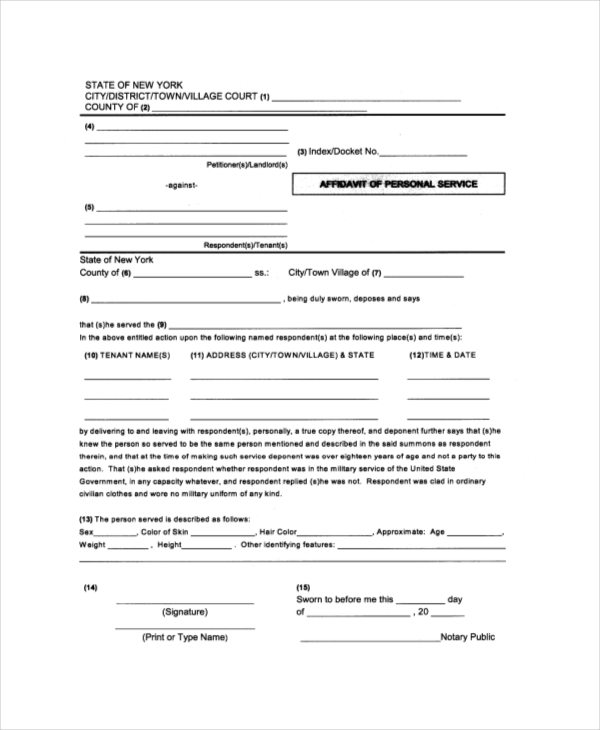 This form can be filled up by a friend or a relative, or can simply hire a professional (process server) to do this work. The date, time, name and contact number plus address should be filled up correctly otherwise; related consequences may surface for procedure in question. A necessary number of copies should be done for extra precaution. 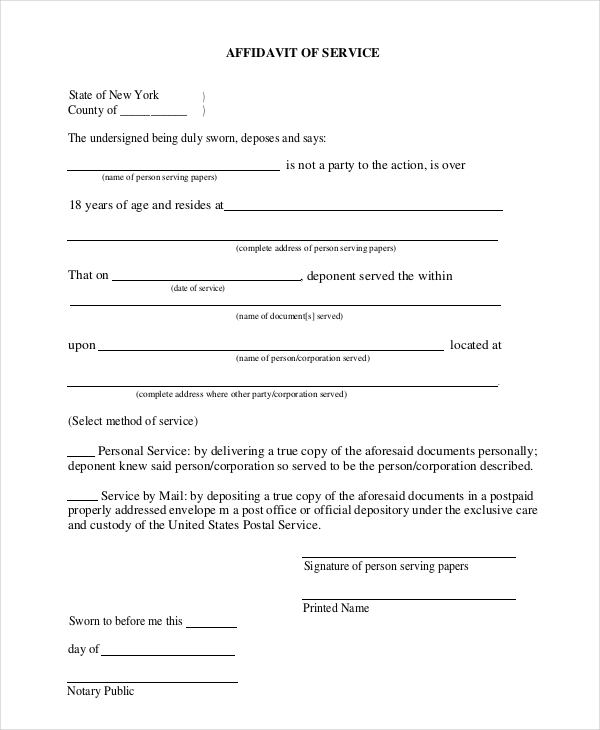 If you reside in the state of New York and require legal forms like Affidavit of Service documents, then you can download this form for free. This makes it hassle free for the person who is using this form. It can be edited and printed out accordingly. An adult has to fill up this form and select the method of service, which can be personal service or via mail. 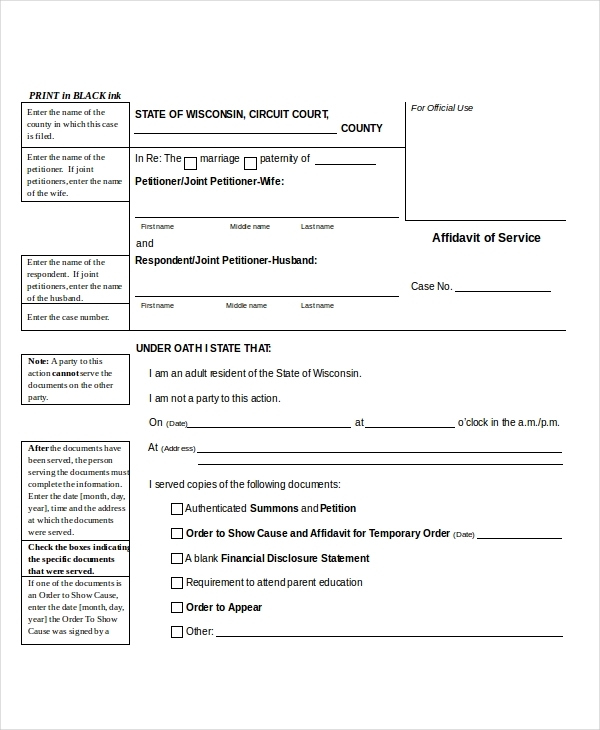 This sample form is issued by the State of Wisconsin, the circuit court. The names of the petitioner and the respondent must be there, along with the date and time. This form must be submitted in time. Also, the required documents like the bank statement and other official papers must be present for the continuation of the ongoing process. An Affidavit of Services is also called the Proof of Services in some places. It is an important document, which is provided by the process servers after they have effectively served documents to someone. It is a notarized testimony that is signed by the server with details like manner of service, identity of the person, date, time, and details of the job. If, by any chance, the party claims that they have not been notarized of the pending legal action, the Affidavit of service forms can be shown to prove them otherwise. This affidavit of service can be used to prove due diligence, for which another kind of Affidavit form is required. 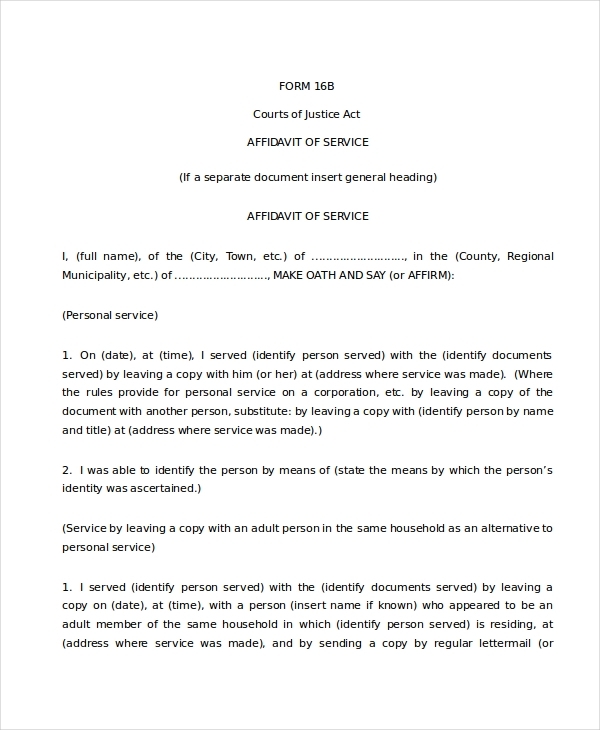 A person may need to attach certain papers to the Affidavit of service forms. The original of the signature must be attached to the Affidavit of service if a person can recognize it on the acknowledgement of service. If the person can’t recognize the signature on the Acknowledgement of service, then the paper must be attached to an affidavit, of the person who can identify the signature with a written statement. If any photograph was used to recognize the person to be served, then that photograph must be attached to the affidavit. A proof that the papers were delivered must be handed over to the court. If the case has begun, the original Affidavit of Service is filed when the legal documents are given to the court. The rules are not the same for filing an Affidavit of service when the case starts. If the documents are served by personal delivery, there is no set time to file the Affidavit of Service. If the paper was mailed, the time and medium must be mentioned. The affidavit is to be signed with the presence of a legal person in public. After the Affidavit of Service is done, it should be filed with the court. Many a times, certain information is filled up incorrectly. The person has to be careful while completing this form. They need to make sure that all the information is filled up correctly and truthfully. There are certain guidelines available when you download the Affidavit of Service forms. There can be instruction on how to fill the form and the mandatory fields that are required to be filled. Be alert while reading the instruction. All the documents required must be present. Official documents that are not present will lead to further problems. Copy of these forms must be there with everyone. This is a wise and important step for every party concerned. Internet now rules the world in every working sector. If you are having difficulty in finding such forms, you must not worry. Our website gives you these important forms that can be downloaded and printed as fast as you want. You can edit them as well, before printing it out. You can get these forms in both PDF and Word formats so that it does not create much of a hassle for you. These forms have a high compatibility, which means you can get them in both higher and lower versions. They are error-free and have been designed in such a way so that it caters to all your needs. You can edit these forms as you need but if you still need further customization, feel free to contact us. We would do it gladly.